If you were born before 1990 you are probably very familiar with the “blue pill and red pill” analogy used in the title of this post. This analogy was made famous in the film The Matrix. Over the past few weeks I’ve been dealing with a choice similar to this analogy in my quest to break free from sleeping late to becoming an early riser. 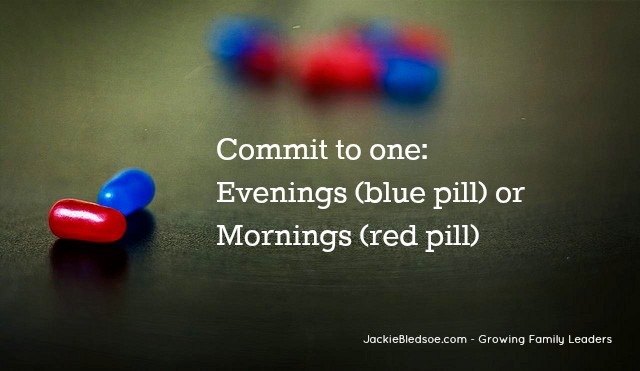 I realized I have to commit to one, late evenings (blue pill) or early mornings (red pill). I can’t have both. What is the blue pill and the red pill? The blue pill and the red pill are completely opposite. The main character in The Matrix, Neo, has to make a choice. He cannot have both, and he cannot reverse his decision once made. The blue pill will allow him to continue the life he has been living, a life a little safer, but less fulfilling. The red pill will lead to a new life, a life which challenges him and open the doors to great things he has never experienced. The blue pill equals easy, common, run of the mill. The red pill equals hard, uncommon, and extraordinary. At the beginning of this month, I decided to take the 30-day Early to Rise Challenge. The challenge was created by Andy Traub in his book, Early to Rise: Learn to Rise Early in 30 Days. I started off strong. I chose a time, and woke up several days in a row at that particular time. I was more productive, more energetic, and more optimistic about each day. Then I hit a wall. It felt the same as before the challenge. In the book, Andy talks of the importance of going to bed early to help you wake up early. Stating you cannot stay up all night and expect your body to consistently rise early. I noticed my challenges with waking up early were consistent with whether I went to bed early or late. I had to commit to one. I had to commit to evenings or mornings. My goal is to be up and out of my bed by 5am every day, 7-days per week. Just like any goal you have to commit, you have to give up something. Staying up late trying to get some extra work done, to watch the game, or to just lay around was not helping. I now know, if I committed to my evenings for any reason, I was choosing not to commit to my mornings. I was choosing not to reach my goal. I don’t want the same run of the mill life. I want to do everything I was called to do. I want to start my day before everyone else does. I want to be awake, fresh, energetic, and to greet my wife and kids like that when they wake up. I want to end my days knowing I got every ounce out of myself as possible. Only a commitment to mornings will help me do that. You may be in a similar place I was when I began the challenge. You may realize you can change your life by committing to waking up early, and being different than the norm. You may realize you have been lazy, and it is getting you nowhere you want to be. You have the same choice I have. It is time to make your choice. Will you commit to evenings? Or will you commit to mornings? Question: Prior to reading this post, what have you committed to? What will you commit to now? Please share in the comment section below.